Finland based cleantech company Evac is growing fast and has already established a position as the world’s leading provider of integrated waste-, wastewater-, and water management systems for the marine, offshore and building industries. Evac had a successful year in 2015. The company grew 40 % compared to the previous year and secured many large cruise, navy, coast guard, and offshore orders during the last quarter, increasing the company’s backlog value with 50 % compared to the previous year. Just recently Evac won a 30 MEUR cruise project including waste and wastewater treatment systems for four cruise vessels. – Our major strength within marine industry is that we have the largest product offering in the market with in-house product development. It means that unlike our competitors we´re able to answer to all our customers´ waste, wastewater and water management systems needs which simplifies noticeably the project management and integration of the different systems, concludes Tomi Gardemeister, CEO of Evac. With Evac systems customers can collect and treat wastewater, recycle or burn dry waste and food waste and generate fresh water with remarkable environmental impact. – With our systems we can purify the wastewater to 99% clean effluent and 1% sludge that can be burned in our incinerators. Our systems also save a noticeable amount of water as our vacuum toilets only consume 1.2 l of water per flush compared to the 3–10 liters consumption of traditional gravity toilets. In average a cruise passenger flushes a toilet 10 times a day which means that the water saving in a cruise vessel with 3,300 persons is in minimum 59,000 liters per day, Gardemeister adds. Evac was established in 1979 and it now has completed over 20,000 marine and 2,000 building projects worldwide. Evac has employees in Finland, Germany, France, China, Korea, the USA, Brazil, Norway, and representatives in more than 40 countries. The company’s estimated turnover in 2015 is 98 million euros. 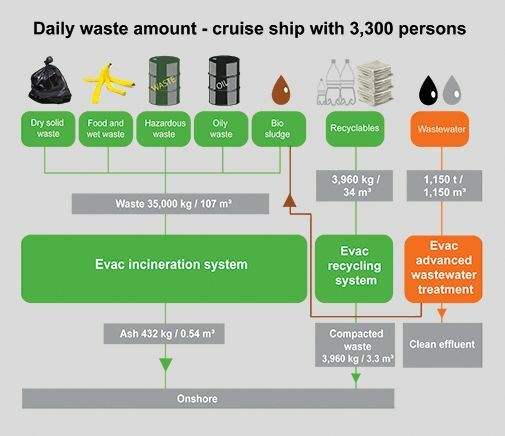 The table shows an example of a daily waste and wastewater amount created on a cruise vessel with 3300 people a day. With Evac systems the numbers are decreased dramatically and all created waste and wastewater is treated in a professional way. 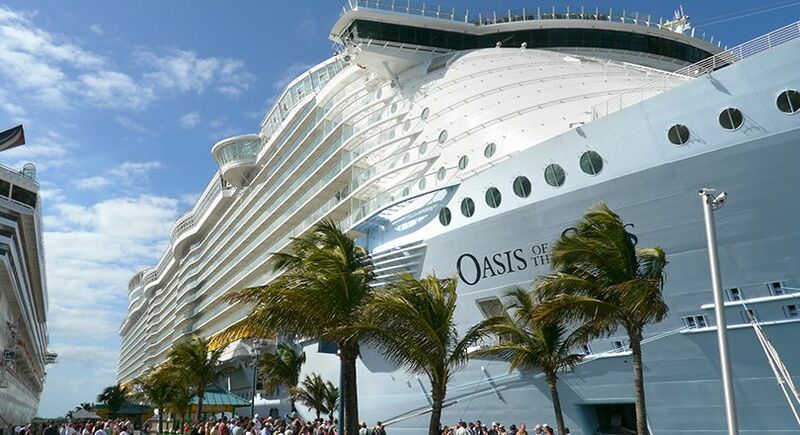 Evac’s waste, wastewater and fresh water management systems can be found aboard Royal Caribbean’s Oasis of the Seas (on the photo) and Allure of the Seas. These two vessels are the largest cruise vessels in the world, each vessel having the capability to carry over 8,000 passengers and crew.